The audience was composed of many dedicated fans who were reppin’ their Kane Brown apparel. The anticipation was high while they waited for the show to start in a packed event center turned concert venue. 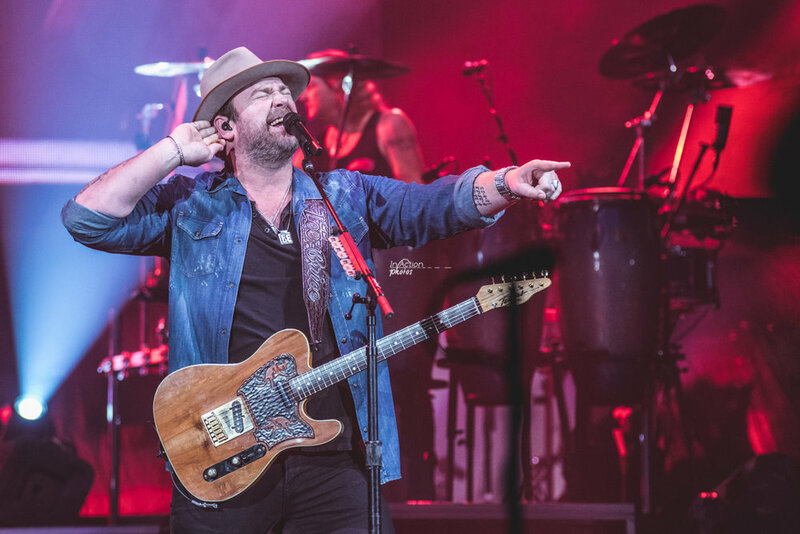 The energy in that room was off the charts with country fans ready to have a good time. Grand Casino was definitely flooded with flannel shirts and cowboy boots. K102 Fan Jam Class of 2017 was like “Billions” of “Hurricanes” with a “Drinking Problem” so just “Kiss Somebody” in the “Greatest Love Story”. Kenny Chesney will bring his Trip Around The Sun 2018 Tour to U.S. Bank Stadium on Saturday, May 5th. Kenny Chesney will be joined by special guests Thomas Rhett, Old Dominion and Brandon Lay. Show time will be 5pm. Tickets will be available at Ticketmaster.com, or by calling 800-745-3000. As you walk into the amphitheater, you walk down the stairs into your seats. It doesn’t matter if you’re seats are right, left or center stage, there is not a bad seat in the house! Stapleton deliver's a shocking reframing of a live performance even though there is an audience rapturously watching. Often it feels as if the whole room is reduced to wordless, loving conversation between two people. It was a beautiful, summer night on Saturday, July 15, 2017 for country night at the 8th annual Lakefront Music Fest in Prior Lake, MN. ...these artists love what they do and they truly know how to put on one hell of a show! 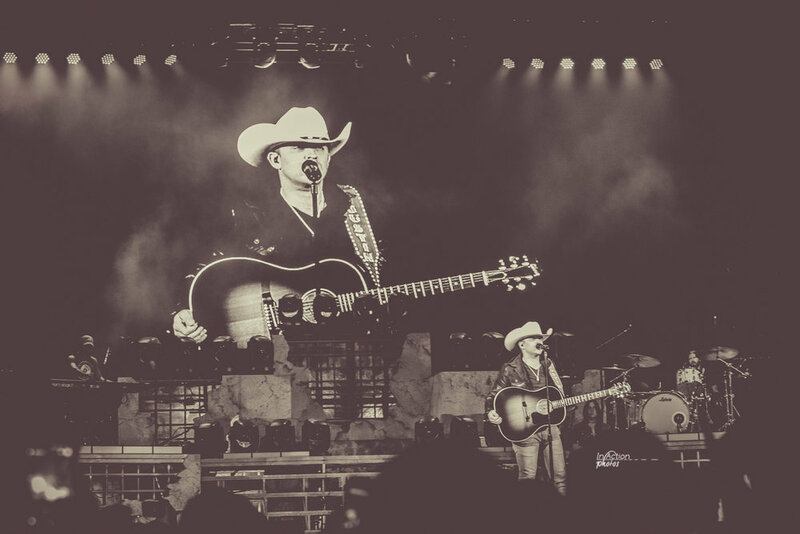 On Saturday night, 4/15/2017, at the Verizon Wireless Center, Justin Moore brought the manpower on board! 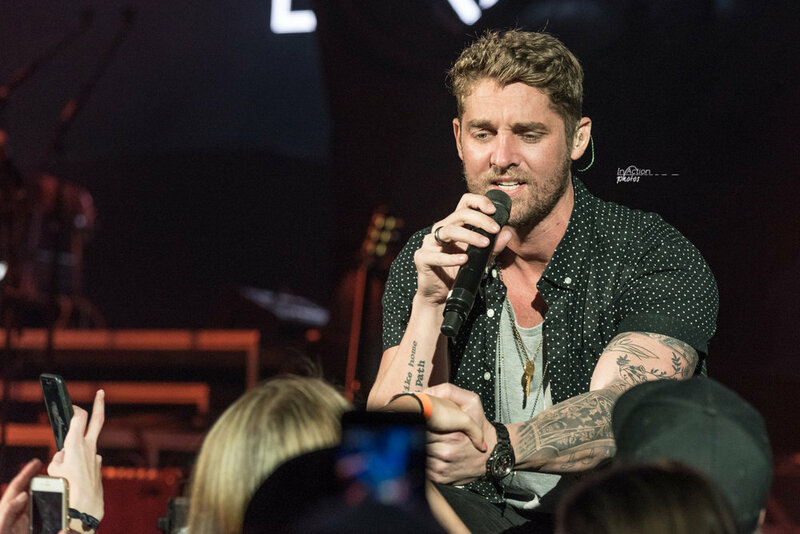 Up and coming California native, Brett Young, and well known artist and songwriter, Lee Brice, took the stage before Moore made his appearance. Emily Huehns had the chance to talk to Moore. He said that life on the road is not what you would expect it to be and that he tries to play as much golf as possible. He enjoys sharing the stage with Brice and Young. He has been friends with Brice for a while and has gotten to know Young a lot better. This is the second time he has performed at the Verizon Wireless Center. He says it's always good to be back in Mankato because the fans are great! The best part of performing is knowing that the fans are having a great time and there is great connection. Moore's main focus is to throw the ultimate party each night! As the lights went out, the crowd hollered as band members took position. Familiar music started to play, (In Da Club by 50 Cent) and the hands started clapping along with the flashing lights. Finally, the 6 foot 6 heartthrob, Brett Young, walked on to the stage. "I can't get you close enough, can't get you close enough"
Young opened with the song, Close Enough, and is the first track off of his self-titled, debut studio album. 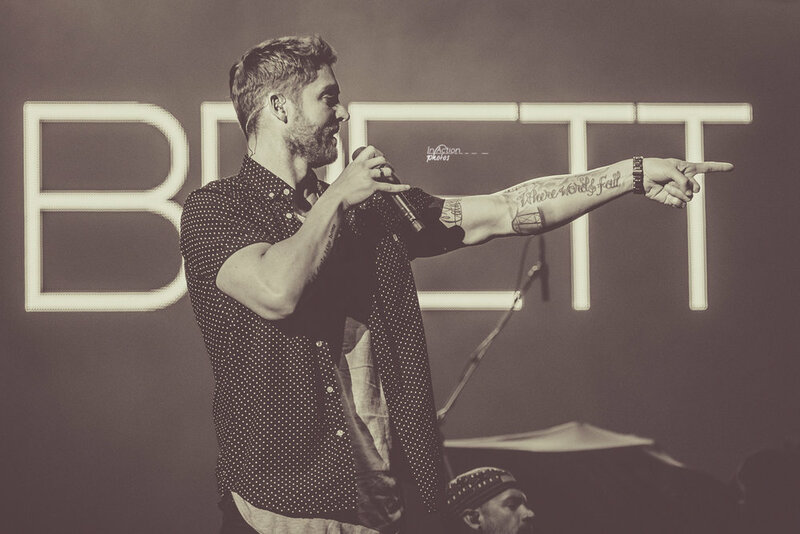 Brett continued to interact with the crowd, sharing personal stories and the reasoning behind his music. He had plenty of heartbreak which led him to write "You Ain't Here To Kiss Me" and "Left Side of Leavin". He even quoted Calhoun Tubbs, "Wrote a song about it, like t'hear it? Here it goes," before strumming his guitar and continuing with his set. "In Case You Didn't Know" is his second single off of his album. 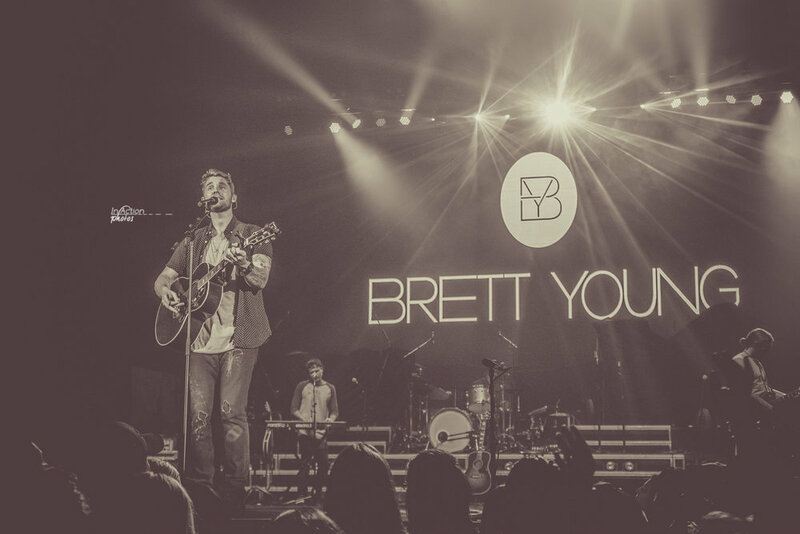 When I first saw Brett, he opened for Brett Eldredge back in October of 2016. I said that this song will be the wedding song of 2017. Before belting out this love song, he thanked his fans for requesting it and for letting him do what he loves. It gave me goosebumps listening to the crowd sing along! He ended his set with his first single "Sleep Without You". 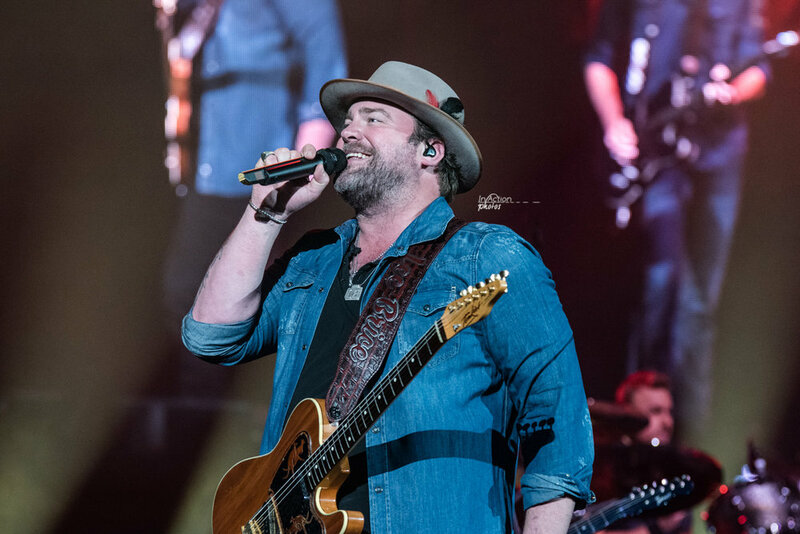 After the road crew set up for the next set, Lee Brice finally took the stage and opened with "Little Things". 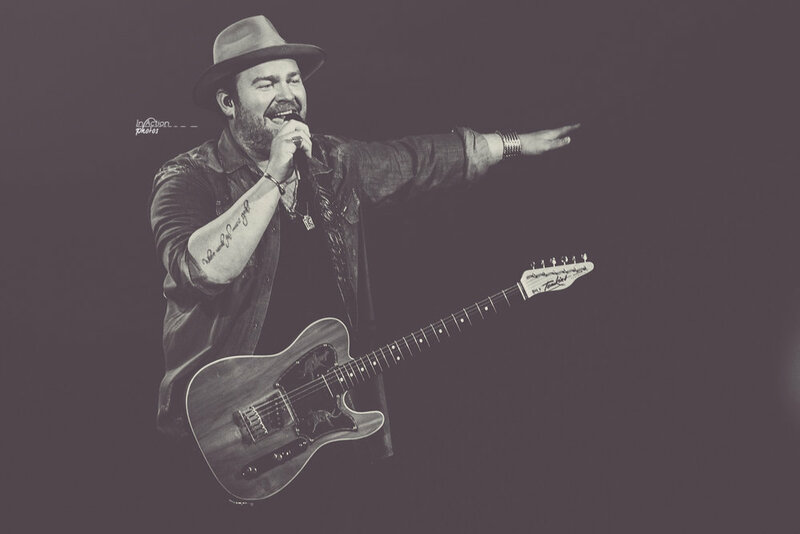 I have seen Lee Brice before at TreeTown and when he opened for Luke Bryan. He definitely knows how to get the crowd going! I was used to seeing him in a backwards ball cap, but he was sporting a hat with a feather for half of his set. The next few songs led a huge sing along. The crowd belted out "Hard to Love" and "Love like Crazy". We even got a glimpse of some new tunes he may be putting on his next album. I really liked the songs "Songs in the Kitchen" and "Boy". That man really knows how to make music!! One of the coolest parts of the night was right before he sang "I Drive Your Truck". A wounded warrior and his family were brought on stage and were given a home through a foundation dedicated to supporting wounded heroes and their families. Lee also gave a shoutout to all those that have served, currently serving, EMS crews and police forces. Lee recognized one of his bandmates for being by his side for 10 years. They toasted over a glass of champagne, while Lee took a swig from the bottle. 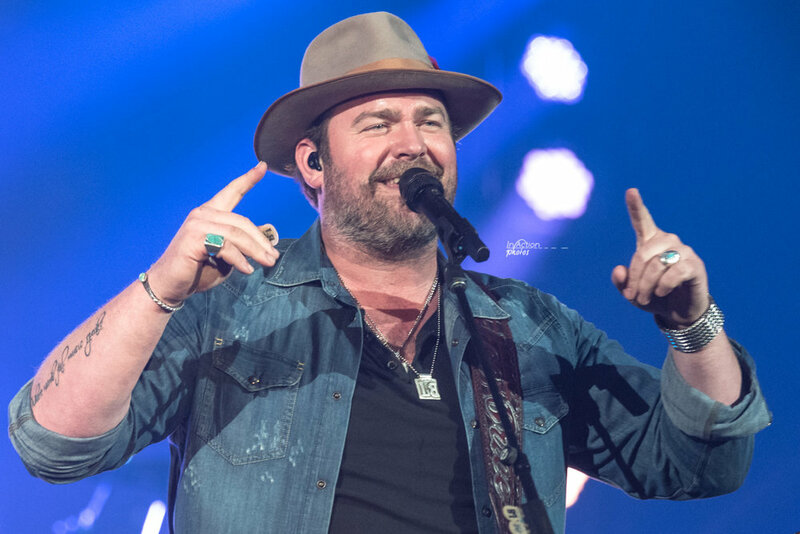 Lee Brice ended his set with his hit song, "Parking Lot Party". 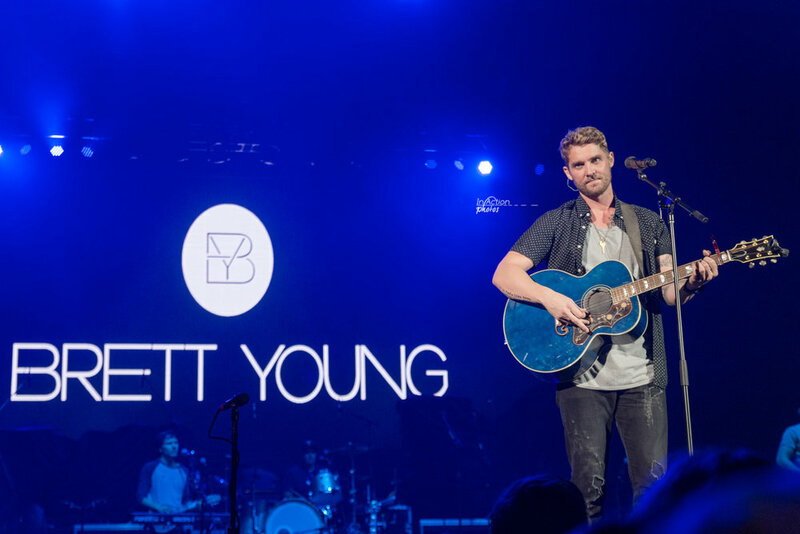 As the chorus began, Brett Young joined to finish off the song. The crowd grew anxious as the minutes went by. Then, the Verizon Wireless Center went black and the fans went crazy! Music started playing and BAM... the man of the hour... JUSTIN MOORE!! Hit after hit, Justin's energy kept his fans entertained and mesmerized by his talent. He may be 5 foot 7, but that man has some strong and powerful vocals. He brings back the 'twangy' style of the older country music we all miss. Justin began to tell a story about his grandpa and how "If Heaven Wasn't So Far Away" is the one song he is so glad he got to record. He said that if he knew that if this song helped just one person, then he's done his job! I believe the reason he named his tour American Made is to honor and thank all those that have served and those that are sacrificing everyday to make sure we are safe. He gave a shoutout to the teachers, police officers, EMS workers, etc. He followed up with singing the National Anthem. When he sang the familiar hit "Till My Last Day", Justin's wife and two oldest girls were on the big screen behind him. He said that the best part of his night is when he can turn around and watch his family. Even as much as the crowd wanted him to play all night, all good things must come to an end. He then thanked Mankato for a great evening, took off his signature cowboy hat, and did a curtsy. All in all, if you love country music, make sure you give these great guys a chance! !